Please contact me regarding the 2019 Gallegos 1040 cft. Capacity - Listing# 580784 for sale at TruckerToTrucker.com. Take a look at this 2019 Gallegos 1040 cft. Capacity. It is Listing# 580784 at TruckerToTrucker.com. 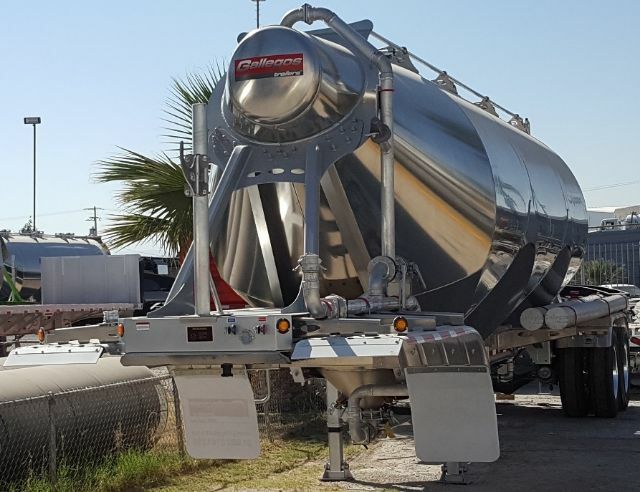 NEW GALLEGOS BRAND 2019: 1040cft	Type: Dry Bulk Pneumatic Length: 42 Feet Body: Aluminum 5454-H32 Cal.3/16 Upper Catwalk: Aluminum 5454-H32 Chassis: 3/16” plate Vibrating System Designed to Operate at: 15PSI Hydrostatic Test: 30PSI Suspension: Hendrickson Pneumatic Intraax 25,000lbs Designed to operate: At 15 PSI Tires: (8) 11R 24.5 WHEELS: (8) ALCOA ALUMINUM 24.5 We sell and finance trailers. "WE WORK WITH ALL TYPES OF CREDIT AND HAVE FINANCE PROGRAMS TO FIT EVERY SITUATION". We make it easy and affordable for you to finance your next truck or trailer quick and easy. Call FRED Today 469-906-2024Hablamos español llámenos hoy para iniciar el proceso para obtener su crédito. Aquí aceptamos todos los tipos de crédito.